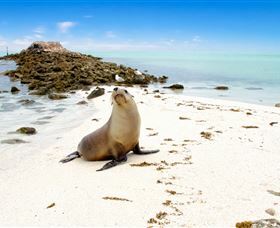 More than 120 unspoiled islands clustered over 100 kilometres of pristine ocean make up the Abrolhos Islands off Western Australia's mid north coast. Fishing around these spectacular atolls is rated among the best in the world, while bird watching is another popular drawcard. Large breeding colonies of sea birds exist on the islands with more than 90 different species identified. 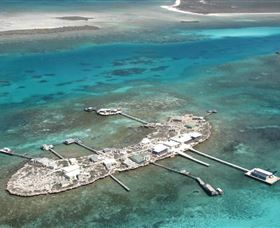 Composed of three groups of 40 islands each, The Abrolhos boasts an incredible range of marine life. Spectacular coral gardens make for excellent diving and snorkelling while sea lions, dolphins and migratory whales are often spotted in the area. The Abrolhos Islands are also rich in maritime history. The infamous Batavia wreck lies on the ocean floor on Morning Reef at the Wallabi group of islands. The Batavia was wrecked in 1629 on her maiden voyage from Holland - the horrendous tale of mutiny and murder is told in the WA Museum in Geraldton. 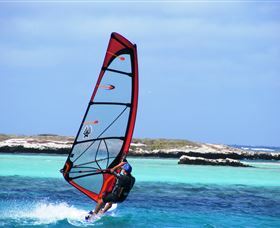 You can reach the Abrolhos Islands by boat charter or scenic flights from Geraldton. Flights range from fly overs, half and full day tours, while boat charters range from three to five days with accommodation onboard. There is no accommodation on the islands.